The SENNEBOGEN duty cycle crane series from 13.5 t to 300 t sets itself apart with the robust design of each and every machine component, such as the uppercarriage, undercarriage, slewing ring, winches, and booms. The reliable duty cycle cranes can be used to mechanically and hydraulically operate various attachments in the field of special underground engineering and mining, including drag-line buckets, double shell grabs, diaphragm wall grabs, diaphragm wall milling cutters, and hydraulic casing machines. The SENNEBOGEN 6140 E is a powerful new addition to compliment the range of duty cycle cranes. Great demands are placed on a duty cycle crane when used in special underground engineering. With its robust design and high power density, the 6140 E asserts its operational performance in every demanding application. With an operating weight of 126 t, the SENNEBOGEN 6140 E can lift a load weighing 24 t at a working radius of 20 m, meaning that heavy attachments can be operated and heavy loads lifted when used for gripping and lifting respectively. The machine's high level of stability is assured by the brand-new broad-track undercarriage with its enormous track width of 5.50 m – that's a 20% increase when directly compared to similar machines on the market, and is clear to see in terms of its improved stability. The high load capacities are reliably achieved thanks to the new boom. 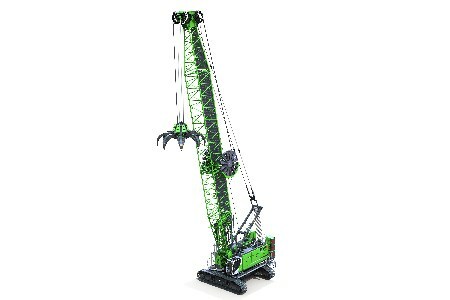 At 1900 mm wide, the strong lattice boom was designed to meet the dynamic requirements of the machine and manages an attractive length of up to 63.5 m. The machine's drive system is also considerable in size, as dynamic movements place high demands on the performance of the engine and winches. The powerful 708 kW (or optional 563 kW) diesel engine is the highest-performance engine variant, ensuring not only sufficient power reserves for every application, but also that it fulfils the stringent requirements of the IV emission standard. Customers demand flexibility and request individual configuration options. The SENNEBOGEN 6140 E offers three winch options as a solution: ss well as the standard 250 kN winches, it is also possible to incorporate a 300 kN or 350 kN winch. The crane is powered by high-pressure regulated variable-displacement hydraulic motors, which ensure optimum power transfer in terms of traction and speed. The Star-Lifter undercarriage allows the track width to be flexibly altered between 4.6 m and 5.5 m. If the wide track width of 5.5 m is set, the counterweight can be increased from the standard version weight of 34 t – 45 t – an advantage of 11 t – enabling even higher load capacities to be achieved. Conceptual changes were also made in respect of safety-related aspects. For example, the doors to the engine compartment can now be opened at the sides. Details such as railings mounted on the uppercarriage and extendable walkways were further enhanced to offer even greater safety on construction sites. Despite its highly robust and heavy equipment, transportation poses no problems for the crane. At 3.5 m, the 6140 E ensures a convenient transport width, and its moderate transport weight of around 55 t (basic machine with standard equipment) means that the machine is easy to manoeuvre between construction sites.